Sadly, these days it’s rare to find a mobile game which challenges the intellectual player. So much of the app game outputs are mindless button-bashing forays into endless levels of similar-looking scenarios. Rinse, dry, repeat. The narrative has been lost, and the subtlety has been lost. Games didn’t always used to be like this. I think of The Legend of Zelda titles for the N64, two genuinely challenging pieces of video game history that are timeless because of their puzzle-solving aspect (and there was no internet to help out any corner-cutters). What a shame, I thought, that that aspect of gaming has been almost lost. What a shame, I thought, that it never made the transition to the burgeoning world of app gaming. I needn’t have worried. Not when forward thinking developers like InertiaSoft are producing games like Facility 47, available now for iOS and Android. The game instantly feels smart. More importantly, it feels like it’s been developed by smart people, who aren’t looking to make a quick buck with some rehash of an existing formula. The game starts immediately – accompanied by an impressive score (a trait that repeats throughout the game as the sound effects and atmosphere remain consistently excellent), you find yourself awaking in an isolated dungeon, somewhere under the earth. Everything around you is frozen. It’s up to you to find your way out. The thing I like best about this game is the mystery aspect. It’s a cryptic offering. Not just with the narrative, which places itself firmly in that genre with an enigmatic letter from the protagonist’s sister being discovered when he awakes; it does so with its atmosphere. There’s hardly any introduction as to what the game will actually be. You have to kind of figure that out as you go along. What it reveals itself to be is a fiendish puzzler, where you have to use your wits to utilise whatever tools you can find around you to escape the icy dungeon and uncover the mystery of Facility 47. Another one of my favourite things about this game is the graphics; they’re absolutely gorgeous. Each situation is presented as a static frame, beautifully rendered with detail and care. It’s an absolute pleasure to play through visually; it’s also extremely challenging, in an addictive and engaging way. The developers have created something really special here, and I applaud them for thinking outside the box and furthering their craft of app gaming. If we can get more games like this on the go, people might actually start taking mobile gaming seriously. A tricky triumph all round. 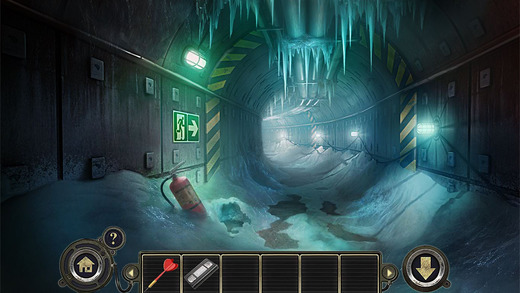 Descend in to the App Store or Google Play and get investigating today for free!